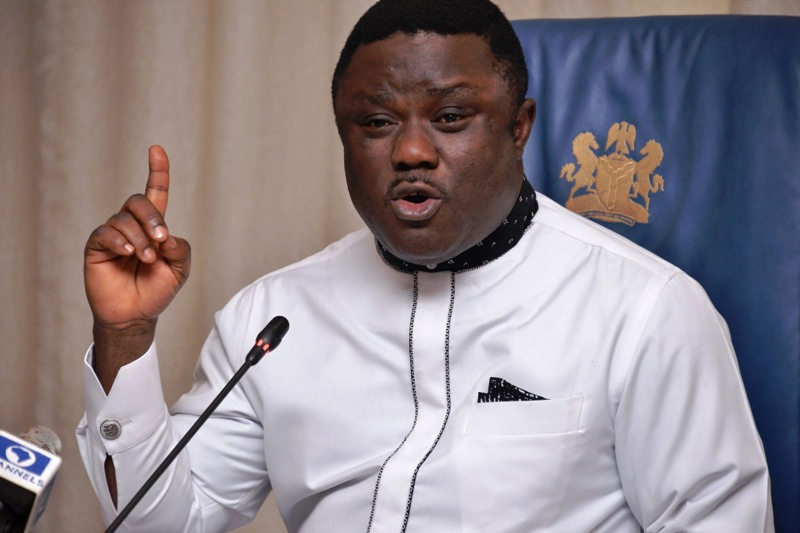 The All Progressives Congress, (APC) Cross River State, has accused the State Governor, Governor Ben Ayade of running a fraudulent government. In a statement made available to DAILY POST on Saturday, titled ‘Cross River State Rice Production and Packaging Farm’, the APC State Publicity Secretary, Mr Mens Ikpeme alleged that Governor Ayade acquired a large expanse of land in Ogoja and named it “Rice Village”. He said, “a fraudulent fake Rice Factory in the State powered through smuggled Rice from neighbouring countries is his newest fraudulent act. “Using same landed property as a facade to re-bag and rebrand smuggled rice named after himself to deceive the entire people of the State. “His several trucks with thousands of bags of rice smuggled into the State was apprehended and impounded by the Nigerian Custom and Excise, this is a commodity banned by the Federal Government of Nigeria. “Governor Ayade’s Government in smuggling bags of rice is the height of fraud in the nation and this leaves a sour taste in the mouth of the public. His numerous frauds mark the state’s poor journey into an equally bad horizon of PDP’s bad government. “Governor Ayade’s numerous inconsistent wonder projects is setting Cross River State in consistent fraudulent bad picture. Do we name his numerous frauds? “His idea of dredging Calabar Sea Port, still fresh in our minds was an alarming fraud. His claim to have financiers who were ready to invest 500 million Euros for same purpose was a lie of the decade. “His construction of tailoring shop in a warehouse owned by him and naming same a garment factory owned by the State can send him to jail for life. On the Super Highway, Mr Ikpeme said “Governor Ayade hardheartedly threw away more than 200,000 indigenous people from their homes of origin, damaging the largest bio-diversity forest in the world that serves as homes to Cross River gorilla, Nigerian chimpanzee, drill monkeys, 2000 plant species of which 400 are endangered, medicinal plants and orchids. “This forest provides tourism value with resulting revenue of more than 8 million Dollars a year to Cross River State, he is rather stealing and logging their timber trees. “Governor Ben Ayade has openly misappropriated billions of Nigeria in funds for the Nations Network for support of food, agriculture and rural development to eradicate hunger and poverty,‎ a scheme introduced by the Federal Government to enable farmers exploit the untapped potentials of the State’s Agricultural sector to reduce inflation, lower the cost of Agricultural production (food items) generate surplus for export, increase foreign earnings as well as diversify the State’s revenue base. “Billions of naira in respect of the above scheme has been received by Cross River State Government, but no account has been given nor farmers enjoy this benefits. Rather, these monies are credited into one Mr. Frank’s account, his blood brother”, he alleged. “His claim to open new cities in Cross River State was a naked lie. His promise to create 10,000 jobs remains a fallacy. His anonymous 71 Tender Bids documentations for the purported super highway and Deep seaport is missing in the State’s records. “The masses experience is a catalogue of misdirection and disorientation mission shaping up the relics of totalitarianism in all its expressions; massive fraud, massive poverty, pervasive corruption, consanguinity of rouged leadership, infringement of people’s rights and grossed tinkering of basic tenets etc. “The All Progressives Congress calls on well meaning Cross Riverians who are in PDP to hurry and leave the sinking ship (PDP) and join hands with the APC to build a prosperous Cross River State. “APC thanks God for Democracy that has given us the opportunity that is knocking on our doors to unseat this fraud called Benedict Ayade”, Mr Ikpeme stated. When contacted, the Commissioner for Information and Orientation, Mrs Rosemary Archibong told DAILY POST that the Garment factory was one of the Governor Ben Ayade’s signature projects. “By saying that none of the projects is working is fallacy and a biased comment. One key project of the Governor Ben Ayade is the Garment Factory and everyone knows and sees that the Garment factory has long been completed and work has been ongoing, people are working and are being paid every month. “For super highway, the 274 km highway is not a work that can be completed within one year, the 274 km highway construction is a no a small fit, the regulatory requirements have since been met, as we speak, the remaining requirement are being worked on. The design of the road has been completed. “Bakassi Sea Port: Federal Government has sent to us the Transaction Advisor, dredging is actually going on and it will be completed this year. By saying that the work has been abandoned is what I do not understand. “On the Rice Mill and seedling factory, the work is about 85% completed, we are waiting for it to be completed and commissioned. “Power Plant: Our 31 megawatt power plant is over 95% completed. We took over the mono-rail project and we have since completed and commissioned it. Calapharm factory is ready for equipment, infrastructure work has been completed but we are expecting equipment. “Though, we faced some challenges, locally, nationally and internationally but it does not deter us from working. We have promised the people housing and we have done that in Bakassi, the houses are at various stages of completion. “The Banana plantation in Odukpani, if you take a ride to Odukpani, you will see the banana plantation that spreads to over 50 hectares of land and it is meant to be harvested this year and of course it is a raw material for our factory. “There are so many things Governor Ayade is doing to change the horizon of the state, we should cooperate with him”, the Commissioner appealed.